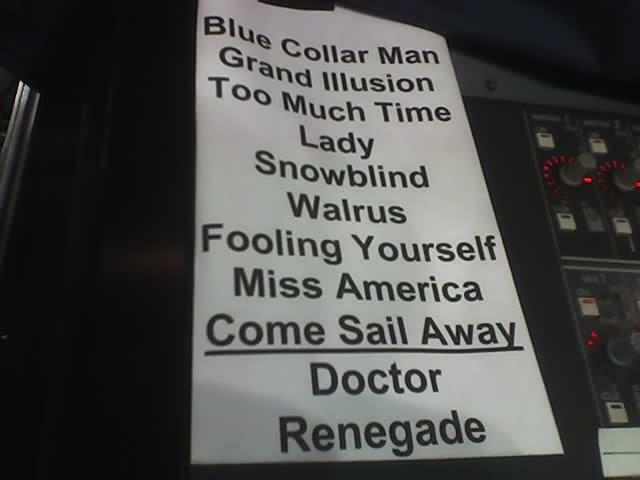 Blog Idaho: Styx Set List. I'm working the REO Speedwagon / Styx concert tonight. I'm really looking forward to it, Styx more than REO, to be honest. I saw them at the state fair last year and they kicked a**. This is the set list, taped to Peter's (the monitor mixer) sound console. Hope to get some good photos tonight. That's a tough one; I like them both for different reasons.